The modern game of football was introduced to Korea by the British navy in 1882. The country’s first football club was established in 1902, with the first official match in 1905. The inaugural All-Joseon Football Championship was held in 1921, and in 1928 the Joseon Referees’ Association was established. In 1933, the Joseon Football Association was established, becoming the Korea Football Association (KFA) after liberation in 1948, the same year the association became affiliated with FIFA. South Korea reached the finals of the FIFA World Cup in Switzerland in 1954. The team went on to win the inaugural Asian Cup in Hong Kong in 1956; finished runners-up in the Asian Games in Tokyo in 1958; won the Asian Youth Championship in 1959, and the Merdeka Cup in 1960. The first professional football club was established in December 1980, and the second in 1982. KFA declared the beginning of professional football in 1983. The national team did well on the national stage in the 1980s. The youth national team reached the last four at the 1983 FIFA U-20 World Cup in Mexico, and the senior squad reached the FIFA World Cup finals for the first time in 32 years. Korea won gold at the 1986 Asian Games in Seoul. KFA launched its plan to host the 2002 FIFA World Cup in March 1994 and was chosen as the co-host with Japan. KFA moved their offices to Seoul in 1999, along with its eight affiliated federations. In 2001, the National Football Centre was built in Paju to provide perfect training conditions to the national teams, which resulted in impressive international results. 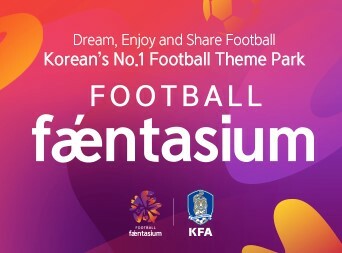 In November 2013, President Chung Monggyu announced the 5 goals, 10 policies and 30 road-maps to mark the KFA’s 100th anniversary in 2033 and encourage football nationally.